I decided that I will be taking off from posting until after the New Year starts up. I wanna concentrate on my time with the Redneck and my son, and just relax, so I won't be logging on the old laptop much at all. I just wanted to wish everyone a very Merry Christmas and Happy New Year. Thank you for reading my blog this year, and really thank you for commenting--it helps me make choices on how to proceed with my little corner of the Internet. The Redneck called to say he is taking us out to Julio's Mexican Restaurant in Chico, Texas, so we can have a special dinner with Obie before he goes to his dad's in the morning for Christmas. I have spent the afternoon getting 'gussied up'. I think I look pretty darn good for 60! I love my new gel polish, it's called Anarchy. Yes, I love black polish. Well, I gotta finish getting dressed and feed horses. Next year y'all. Merry Christmas Evelyn!! You look fantastic and honestly even in no makeup look ten years younger! 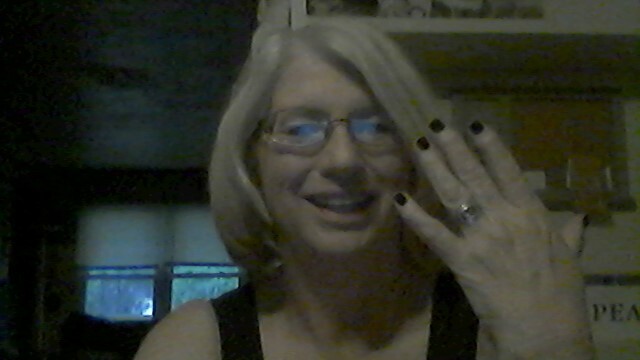 I bought black nail polish once but referendum dark reds and browns. Happy holidays to you, Obie and the Red neck! Love this blog!! Thank you, how sweet! I love reds too, the brighter the better. I will start posting again later today, I have some fun and informative posts y'all should like! Happy New Year!